It's been a long break for NBA fans...especially Raps fans, with almost an eight month layoff. But the Raptors basketball season (well, at least the preseason) begins today against the Boston Celtics. Again, it's another season with a whole crew of new faces on this roster with additions of Rasual Butler, Aaron Gray, Anthony Carter, Gary Forbes and Jamaal Magloire. Expect a season that won't be full of a whole lot of wins but definitely full of growth and development for the future. DeMar DeRozan - The New Leader? 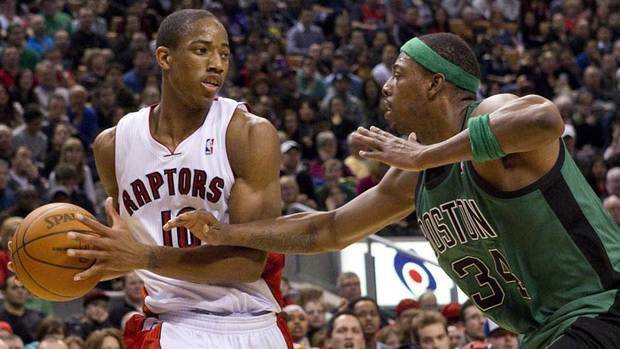 There's no question that DeMar DeRozan is or will be the new leader and face of this franchise. He's still only 22 years old but it's clear that he's the future of the Toronto Raptors. This will be his year to continue to develop and establish his role as the leader on the floor. Dwane Casey is bringing championship experience to Toronto. After spending time on the coaching staff for the 2011 world champs, Dallas Mavericks, Casey will be expected to bring that respect and winning attitude to a team that has been struggling for many seasons. And with that background, fans will be expecting big improvements from last season's performance. He'll also be expected to be the guy that can break Andrea Bargnani into the player that Raptors fans have been waiting to see. One of the aspects that the Raptors lacked last season was veteran leadership. During the offseason, it looks like Colangelo has solved that issue by bringing in Jamaal Magloire, Anthony Carter and Rasual Butler. With these additions, hopefully, the Raptors will show more maturity and will be able to close out games in the closing quarters.